“Rhubarb & Custard” a range of stripy circus tents. Bigtopmania Tent Range No 2; has various sizes of red and yellow stripy circus tent for hire and use. 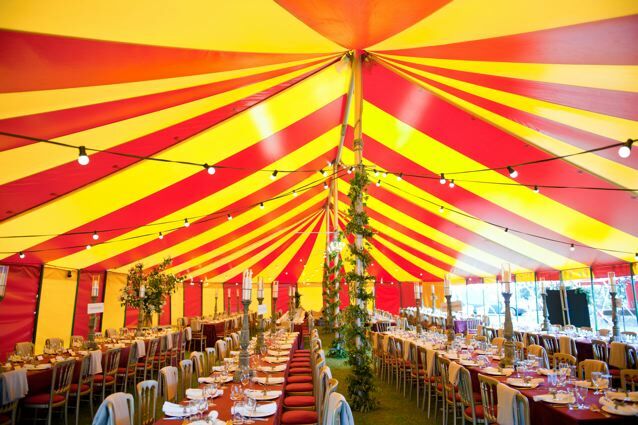 Red and Yellow, stripy circus tent style marquee. Available as either; 12m round, 12 x 17.5 m, 12 x 23m, 12 x 28.5m or 12 x 34m oval. We have an ever-expanding range of stripy circus tents and our red and yellow range is dubbed ‘Rhubarb and Custard’. We have 2 set of round ends and 4 sets of midsections. Another mid section is being manufactured for 2018. The tents can therefore be installed in two sizes at the same time. Usual wall height is 2.1m / 7ft but we now also have a new set of taller 2.5m / 8ft walls, made in 2017 with very strong wooden side poles. “Rhubarb and Custard” is a 12m round tent. (113 sq. m). 1 king pole. “Double Dollop” is a 12 x 17.5m oval tent. (179 sq. m). 2 king pole. 1 mid section. “Mr Big” is a 12 x 23m oval tent. (245 sq. m). 3 king pole. 2 mid sections. “King Size” is a 12 x 28.5m oval tent. (311 sq. m). 4 king pole. 3 mid sections. “Emperor” is a 12 x 34m oval tent. (377 sq. m). 5 king pole. 4 mid sections. “Coming soon in 2018” is a 12 x 39.5m oval tent ( 443 sq. m) 6 king pole, 5 mid sections. Full size spec’s, capacities and prices are on the price list. It is a bright and beautiful tent range. It doesn’t just do the festival circuit and this tent is kept clean and shiny for nice weddings, theatre events, schools, university balls and parties too. Could this be the tent for your event? How can we help you? If you want an authentic circus theme event then you need a proper circus tent and at sizes from12m span these tents are a manageable size that can fit into large gardens or grounds. We don’t need HGVs, Fork lifts, generators for install as everything is carefully done by hand. Circus themed birthday parties for Children’s Parties, Adult 18 th’s, 30 th’s , 40 th’s etc, or have a look at a lovely 21st we did in Hungerford. Get some ideas. Corporate fun days for the company that wants to give their employees a different experience to traditional corporate fun days. If you like what you see, why not drop us an enquiry to find out more about our red and yellow stripy circus tent range. Marquee Specifications and Technical Information. Marquee manufactured in Britain by a MUTA member company. Marquee Design: Traditional colourful Pole Tent with ridge bar roof. Marquee Manufacture: Made in the UK, near Stroud to BS EN 13782:2015. All in VGC. Marquee Sizes: 12m round to oval 12 x 17.5m, 12 x 23m, 12 x 28.5m. 12 x 34m. 12 x 39.5m. Extra space for anchorage. Marquee Capacities: variable pending circumstances and safety allowances. Seated meal up to 400-450. Standing up to 750 at 0.5sq.m per person, 1000+ at 3 per sqm. Less / more pending event input. Up to 1300 in 2018! Marquee Walls: 7 ft/2.1m height available as full set in red & yellow. 8 ft/ 2.3m height available since 2017. Also panoramic window and rip away fire exit doors. Marquee Uses: Circus, Party, Wedding, Event, Stalls, Catering, Theatre, Gig Venue, carnivals, fiestas , festival marquees etc. Spanish theme events? Fairground theme events? Marquee Extras: Porches, flooring, dance floor, heating, lighting, electrics, furniture, styling, decor, matching tents etc.